Patrick Seitz is primarily known for his work as the guy who yells out "Super Electromagnetic Shrapnel Cannon!" in Code Geass, Seitz's body of other, lesser work stretches back to the year 2000. 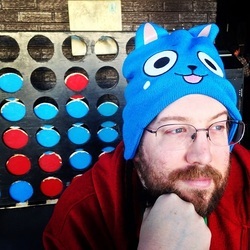 When he's not busy playing Love Live: School Idol Festival, Patrick Seitz gets paid to voice guys who A) yell a lot, B) wear an eyepatch, C) have an accent, or D) sport a cool haircut. Have your doubts? His anime credits include: Gamagoori from Kill la Kill; Dio from JJBA; Franky from One Piece; Laxus from Fairy Tail; Keith from Attack on Titan; Motochika from Sengoku Basara; Senji from Deadman Wonderland; Isshin and Kenpachi from Bleach; Germany from Hetalia; Agni from Black Butler; Simon from Durarara; Kunzite from Sailor Moon; Sky High from Tiger & Bunny; Luke Valentine from Hellsing and Hellsing: Ultimate; and JP from Redline. Grimmer from Monster and Nekozawa from Ouran High School Host Club don't really fit any of those categories, but they're cool, so they're on the list! On the video game side of the equation, Patrick's credits include: Helvar in For Honor; Hector and Draug in Fire Emblem: Heroes; Ragna in the BlazBlue series; Garrosh Hellscream and Arthas Menethil in World of Warcraft; Scorpion in the last few Mortal Kombat games; Artanis in StarCraft II; Kog'Maw, Lucian, and Renekton in League of Legends; Kana Rua in Pillars of Eternity; Basilio in Fire Emblem: Awakening; Samson in Skullgirls; Chopin in Eternal Sonata; Riptide, Hot Head and Chomp Chest in the Skylanders series; and create-a-character voices in Dragon Ball Xenoverse and The Sims 4. Patrick also does script-adaptation and ADR directing-most recently, for the English dub of Your Lie in April. If you've seen shows like Steins;Gate, Romeo X Juliet, Space Dandy, Princess Jellyfish, Deadman Wonderland, Future Diary, or Danganronpa: The Animation, he done writ some of them words-or, in the case of Summer Wars and Wolf Children, *all* of them words! His directing credits include State of Decay, Fire Emblem: Awakening, Citizens of Earth, Rune Factory 4, Conception 2, Shin Megami Tensei: Devil Survivor 2 Record Breaker (breathe! ), Monster, Girls Bravo, and BlazBlue: Alter Memory.